April 19, 2012 - Delta Air Lines has signed a corporatewide settlement agreement with the U.S. Department of Labor's Occupational Safety and Health Administration in order to protect workers who operate baggage handling vehicles. The agreement covers approximately 90 of the Atlanta-based company's airport sites that fall under federal OSHA's jurisdiction, as well as 16,000 Delta employees and 6,000 baggage handling vehicles. Under the agreement, Delta will come into compliance with applicable requirements for the use of seat belts by ensuring that all types of the company's baggage handling vehicles are equipped with them and that employees use the seat belts while operating the vehicles on specified airport routes. "OSHA's corporatewide settlement agreements are highly effective tools for ensuring that companies address hazards that can injure or kill their workers," said Assistant Secretary of Labor for Occupational Safety and Health Dr. David Michaels. "This kind of widespread change within corporations can go a long way toward keeping workers across the country safe and healthy at the end of every workday." The agreement is the result of a citation issued to Delta following a workplace fatality in which an employee operating a baggage tug vehicle without wearing a seat belt was ejected from the vehicle and died. OSHA cited Delta for violating 29 Code of Federal Regulations 1910.132, which requires employers to provide employees with personal protective equipment, including ? in this case ? seat belts. According to the agreement, Delta has committed to an abatement schedule that will result in full compliance within two years. During the first year, Delta will train its employees on the proper use of seat belts and install seat belts on those pieces of equipment that currently lack them. During the second year of the agreement, the company will fully enforce seat belt use among its employees, as well as hire safety consultants to monitor the company's implementation of its seat belt use program and report the results to OSHA. 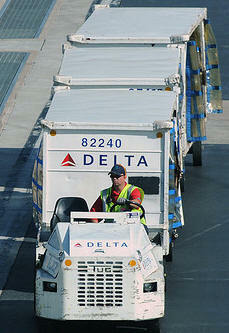 In addition to entering into the agreement with Delta, OSHA will address this hazard throughout the airline industry. The agency recently sent a hazard alert letter to airlines across the nation reminding them that they are obligated to comply with applicable seat belt use requirements.